There have been a few goings-on around here that I’ve been quiet about. One in particular that has had most of my my attention has also be sucking up all of my energy and not leaving me with a lot of brain power left to write or sew. It’s hard when that’s how you make your living! But now I that have some energy back, I’ve been able to get a bit of sewing done, starting with a maternity tshirt! We’re expecting our first little one in early November! It’s been pretty hard not to say anything, especially with my last post talking about motivation. I knew that this baby was draining a lot of my will to do anything besides nap, but I don’t think I realized just how much early pregnancy was affecting me. I tried to fight against it, but I’d sit at my table and stare at my projects. I had to start all over again! None of the plans that I had for summer sewing were going to work out! 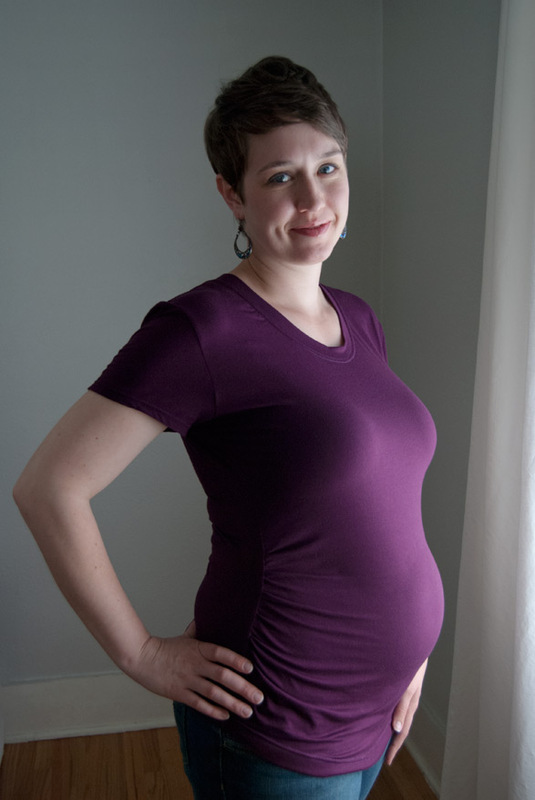 I remembered that Megan Nielsen had a line of maternity patterns though, so I bought the Ruched Maternity tshirt and sewed it up with a drapey rayon knit that was in my stash. It felt really good to take a project from start to finish with no adjustments. I really like that this top will stretch and grow with my belly. All of my tshirts were getting a little short, and I can’t stand wearing short shirts! You will never, I repeat, never find me wearing a crop top (especially now… although that might be hilarious). I really like that the gathers on the side seam are only on the front part of the shirt. I bought a maternity shirt with gathering on both the front and back bodice and it’s kind of annoying. Can you tell I’m picky about how my clothes fit?! I used my new Bernina L220 cover stitch machine to hem the shirt and stitch down the neckband. I am sooo in love with this machine! I will give you a full write-up about it very soon. It’s amazing and I want to use it all the time. I do have some garment sewing plans that involve a few patterns already in my stash. I think the Jamie Christina Mission Maxi will work well in a stretchy fabric and I plan on sewing a Colette Laurel out of a knit as well. 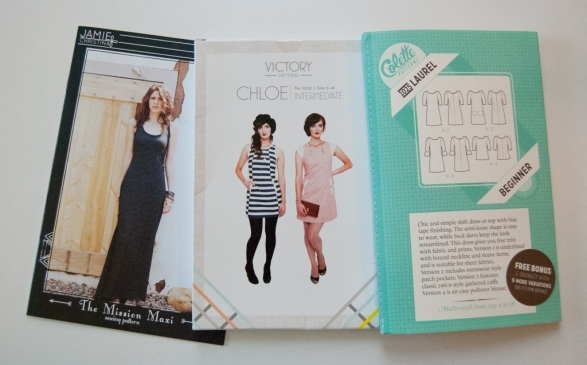 The Victory Patterns Chloe dress could work, as long as I add fabric to the center panel and rework it a bit. We’ll see if I get that far! I am pretty excited to start sewing for this little one soon. I’ve been eyeing lots of beautiful quilting cottons for tiny clothes and of course, a quilt. I think that the Noodlehead Super Tote might make a really cute diaper bag too. There’s so much to do! 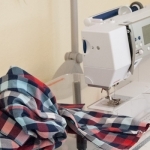 This entry was posted in Life, Projects and tagged sewing, shirts on June 11, 2014 by Amy Alan. Amy, you have filled me with your joy on this post! You look beautiful–absolutely glowing! Congratulations!! And have fun sewing for your little one, too!!!! Thank you so much! 🙂 I am so very happy, and I can’t WAIT to start sewing for him or her! So fun Amy….a Big Congrats to you and your hubby!!! Hahaha! OF COURSE you guessed it! I knew that someone would, probably YOU! 😉 Oooohhh I can’t wait to sniff a fresh baby head. It’s the best! And these little baby kicks?! Amazing! I have so much sewing to do. These next few months are going to fly by! Amy this is awesome congratulations!!!!!! And btw you look fabulous!!!!!!!!! Sewwww excited!!!! Thank you, Bea! I am really very happy with the shirt. I have the fabric for three more waiting to be sewn up. It does feel like this is all going by quickly, but at the same time, it’s taking fooooorreevveerr. I want to sniff a fresh baby head! Haha! Congratulations!!!! You (and the shirt) look great! You look so great! What a marvelous announcement. I wish you the best! Oh how precious! You look like you are glowing! I am happy for you! “best days are when babies are born” (Melanie from Gone with the Wind)…Congratulations! Thank you! I am so very excited (and now I’m going to add Gone with the Wind to my Netflix queue)! CONGRATULATIONS, so happy for you. That purple top is beautiful. Could you make a tutorial when your not tired on making T shirts? I have been struggling with the confidence to make one. All three of my pregnancies drained me until about 14 weeks or so. You will perk right up and make supee cute baby clothes! Thank you, Melonie! I am really happy with the shirt. Could you tell me if there’s anything specific you’d like to see about making tshirts? What are the parts that are frustrating you? 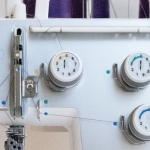 Are you making the tshirts on a serger or sewing machine? I’m still waiting for the “2nd trimester energy boost”. I feel like it’s a myth! It’s gotten better, but I’m 19 weeks and still taking a nap every day. I’d probably better check my iron levels. Congratulations!!! Such exciting news and you do look terrific. I’m taking your Craftsy class on serging right now, and I have to wonder if you’ve ever had a bad haircut – you rock it all. Would love to see the Chloe when you’re finished. Don’t work too hard! Thank you, Suzanne! I hope you’re learning a lot in my serging class. Haha- oh yes, I have had many bad haircuts, but thankfully they are in the past now that I have a great stylist. There is photographic evidence of me with bad cuts, but I am going to hunt down aaaalll of those photos and make sure they disappear. Yes! I will post the Chloe when I’m done, along with instructions for the pattern alterations I decide on. Now I just have to find the right knit fabric for it. Awesomesauce! Congrats on the coming addition to the family! The top is beautiful—and having several pregnant friends at the moment, I would love to hear more reviews on maternity and baby related patterns. Thank you! I do have to give a big thumbs up to this pattern. I love that it is long and it isn’t tight. There are lots of maternity tops that I tried on that felt very constricting. I’m making these for my pregnant friends for sure! I’ll also write up about any other patterns I make for myself or the wee one. Hello, Denise, and thank you! I am soooo excited to start making teeny tiny clothes. I think they’ll be satisfying to make because they’re so small and will sew up quickly. Congratulations, Amy. So glad you’re back in the swing!! Just think of all the cute baby clothes, bibs & burp cloths, etc to whip up….. using all those serging stitches I just learned on your Craftsy class! I know your baby will be as beautiful as you are. Thank you, Liz! You are too kind. I know, I’m really excited to find out what we’re having so that I can start buying fabric. It’s been really hard to resist the cute baby prints, but soon I’ll get to buy all kinds of things. Hmm… I wonder what kind of “quick baby shower serged gift” ideas I can come up with for a future post? congrats to you and your new family. You look so beautiful Amy! Love to you !! Thank you, Aunt Lori! 🙂 Love you too! Congratulations! It’s amazing how bad you can feel for weeks and one day you wake up and viola! Feel like a new person! Love the top. Hi, Joy, and thank you! Yes, I have days where I have big bursts of energy, and I wonder, “Where did that come from?” Overall I’m still pretty tired though. Fingers crossed that subsides soon! Biggest congratulations to you! 😀 I remember how exhausted I as the first few month, I’ve never been able to sleep during the day except when I was pregnant. Thank you Jennie! I am still taking a nap every single day. My brain shuts down in the early afternoon, and I can’t fight it. Thank goodness I work from home and can sleep, but I’m ready for an energy boost of some kind. Congrats! on your baby! May the Lord bless you and your family! So exciting!!! Congratulations! You are too cute:) I can’t wait to see what you make for your little one! Thank you! 🙂 Dax has no idea that his “I get all the attention and love and cuddles all the time” world will come crashing down in a few months. I sense lots of treats (and a few extra pounds) coming his way in November. Haha! I take it you’re a November baby? I worried about having a baby with a birthday close to the holidays, but at least it’s not a Christmas kid! Yep, November 10th! I did get kind of ripped off on birthdays because my sister’s is 8 days after mine, so we always had to share a party, and sometimes we had combo birthday/Christmas gifts. But it’s nice now that I’m an adult because Veteran’s Day (the 11th) is a teamster holiday, so film crews almost never have to work the day after my birthday! I hated sharing birthdays growing up! I had cousins on both sides of the family with birthdays near mine, so we always shared. That would be so much worse if it was a sibling. Ha! And combo birthday/Christmas gifts? Come oooonn, mom & dad! Not fair! Our baby is due November 8th. She might not debut until the 10th though, we’ll see! 😉 I didn’t think about Veteran’s Day. That would make for a really nice birthday day off. Congratulations!!! We in Indiana are so excited for you – and wishing you were closer. This little one will be the best dressed in town. I am such a bad blogger and am just reading this now. I moved last month and to say that it was time consuming would be an understatement! Congratulations Amy! I’m thrilled for you and I’m glad you’re feeling better. 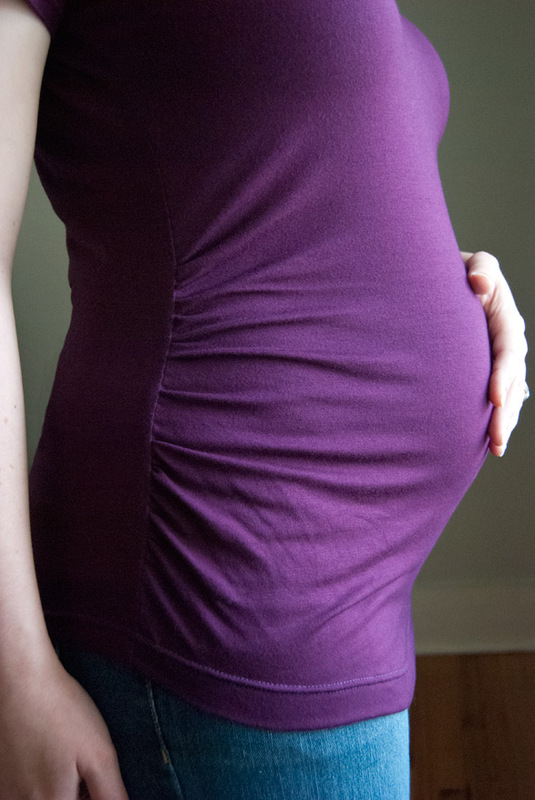 I heard – definitely haven’t experienced it – that the first trimester is the toughest. Oh I’ve been so terrible about reading blogs/commenting lately. I have soooo much to catch up on! I have seen a few photos of your lovely new studio though. It’s beautiful! Thank you very much! Yes, the first trimester was kind of tough, but I was actually lucky in that my only symptom was being tired. Now I have a lot of catching up to do so I can get to sewing tiny adorable things! That’s wonderful news but never push it because as longtime mother of long grown 3 healthy children, I always had to ‘go with it’ due to other issues that have been fixed a longtime and while I didn’t have the issues I have now (severe fibromyalgia with Lyme disease thrown in for good measure) & that’s my reason for only watching the class! You can’t do justice to 1st priority & the new little one that’s needing you is counting on you to give 1000% which I am sure you are doing-never feel guilty for that! I wish you the best. I still haven’t ‘acted’ in the Craftsy class but have watched it all and you are simply the ‘best’! There will never be any to top your class! You have a natural talent for teaching and, of course, knowing your subject as well as you do helps a while lot also. Tonight I looked at the class projects and I assume that makes you proud since so many are beautiful & creative. Maybe by the time you are back to teach another class, I’ll be caught up and have my projects shown in your gallery-I’ll be sure to sign up for any class you teach. I am definitely not pushing it. I love my slow walks, long naps and taking it easy. It has been hard to give up some activities such as most Zumba dance classes and to put off some projects in favor of resting, but I know it’s better for me than being stressed or pushing myself to exhaustion. Thank you so much! 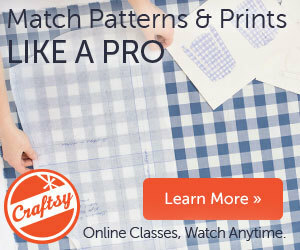 I am so happy to hear that you like my Craftsy class. Yes, I am very proud of the projects my students post. They all turn out so well! I will be sure to look for your projects in the future. congratulations! Be kind to yourself, making a new human being takes a lot out of you lol. I sewed and prepared like a maniac the last month or so but the rest of the time was a slug. You’ll find the happy medium I am sure, we all do. Looking forward to some adorable baby pics and projects! Thank you! Yes, it certainly does take a lot out of you! I can’t believe how quickly I tire from doing something as easy as taking the dog for a walk. I’m glad to hear that I may have a chance of getting some energy during the last month or so. That’s all I’ve wanted to hear! I haven’t made a single baby item yet. My brain is just worn out by the time I get to sewing for the day. I’ve got good intentions (and lots of fabric/patterns), but no energy to make anything. Fingers crossed that changes soon! I missed the earlier announcement. Congratulations! As a dada of 2 huge congrats! Your life with never be the same, nor would you want it to be. you are rocking this Amy!! Thank you, Rachel! 🙂 It’s nice to hear from you! Older post: What Motivates You To Keep Making?